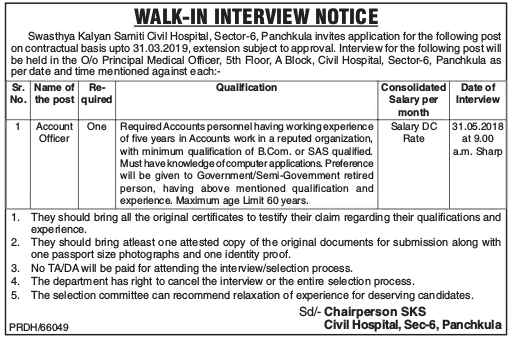 Swasthya Kalyan Samiti Civil Hospital, Sector-06, Panchkula has given a notification of 01 Account Officer Vacancy on the contract basis. The interested candidates can attend walk-in-interview for Civil Hospital Panchkula Recruitment 2018 on 31 May 2018. Swasthya Kalyan Samiti Panchkula Recruitment 2018-19 notification is out. As per the Notification, there is one Account Officer Vacancy. The educational qualification is B.Com or SAS qualified. The maximum age limit is 60 years. If you are looking for DC Rate Jobs in Panchkula, Haryana then this article is going to be very helpful for you. Required Accounts personnel having working experience of five years in Accounts work in a reputed organization with the minimum qualification of B.Com or SAS qualified. The candidate must have knowledge of computer applications. Preference will be given to Government/Semi-Government retired person, having above-mentioned qualification and experience. As per DC rates Haryana. You can attend walk-in-interview on 31.05.2018 in the office of Principal Medical Officer, 5th Floor, A Block, Civil Hospital, Sector-06, Panchkula (Haryana) along with the one attested copy of the original documents for submission along with one passport size photograph and one identity proof. Date of Interview: 31 May 2018 at 09.00 AM Sharp.